The NBA has developed scores of school programs over the years, tirelessly promoted the sport and made critical contacts by wining and dining officials. It runs grassroots programs such as clinics and camps, and puts out a Chinese-language version of its official magazine Hoops. Fifty-one television stations in 20 or China’s 22 provinces broadcast games, including state-owned CCTV network, which shows games live in the middle of the night. Televised NBA games have an average of 558,100 viewers. NBA.com/China website averages 12 million hits a day. The NBA has broadcast games in China since the mid 1980s and was the first professional U.S. sports organization to stage games in China: in 2004, the Houston Rocket, with Yao Ming, and Sacramento Kings played exhibition games before standing room only crowds in Shanghai and Beijing. Tickets for the games went for between $35 and $240, more than what many Chinese make in a month. In October 2007 the NBA played a series of games in Macao and the mainland. A team made up of NBA stars played a national team led Yao Ming in a charity game to raise money for rural school children. China is now the NBA’s largest foreign merchandise market. Goldman Sachs has valued NBA China at $2.4 billion. The growth of the NBA in China has outpaced economic growth in China. In 2006, the NBA announced it would double the size of its operation in China to keep pace with increased demand for NBA products and broadcasts. Demand for NBA products has been growing at a rate of 30 percent a year. One of the biggest problems the NBA has with making money in China is the pirating of goods with the logos of NBA teams, particularly the Rockets. One of most important issues it needs to settle is how to compensate the CBA for cherry picking its best players. In 1985, NBA commissioner David Stern met with a group of Chinese basketball dignitaries and told them, “Someday I hope that we can entertain you as our guests.” The Chinese took that as an invitation and issued him a formal invitation a week later. Sterns’s visit generated the NBA-China Friendship Tour that year. Sterns later said the event was so hastily arranged that he found a sponsor---a nonalcoholic beer called Kaliber---for $20,000 when the team was on the plane to China. In the 1980s the Chinese national team was described as “decent Division 1" university level and so far below NBA level that NBA teams treated games with the Chinese team as practice and went through some effort not to run up the score. Two NBA coaches that spent a few weeks trying to whip the Chinese team in shape scorned the assignment and couldn’t remember the players names. During a tour of the United States the Chinese spent most of their time at the LaGuardia Airport Marriot and practiced at Queens s College. They were able to beat Queens College, a Division III school, but seemed more interested in sampling McDonald’s hamburgers. In the 1980s the NBA didn’t charge for television rights to build interest and loyalty. Now 51 broadcasters in China show NBA games. The first NBA employee in Asia worked out of an apartment in Hong Kong and often participated in conference calls in his pajamas because of the time difference. One of the keys to getting Chinese fans to know the game better was producing a program similar to NBA Inside Stuff that featured players off the court as well as on it. It was locally produced and hosted by David Wu, a well known MTV Asia VJ. A 1994 game between the Houston Rockets and the New York Knicks was the first NBA finals game televised in China. There are plans for an NBA-affiliated league and a league partnership with “eight or 10 or 12 teams throughout China.” The league would be independent but NBA-sponsored and would start at a relatively low level and develop and improve as the league grows and strengthens. There is talk of someday having the winner of the Chinese league play the NBA champion in a playoff series. The NBA is involved in installing about 800,000 baskets in villages across China. It has its logo on milk containers in Inner Mongolia. The NBA teams Milwaukee Bucks and Golden State Warrior played two exhibition games in China---in Shanghai and Beijing---in October 2008. 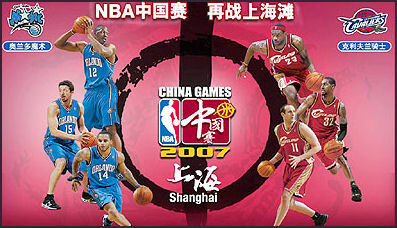 These games and other events were part of the NBA’s Sichuan earthquake relief program. The Rockets played two preseason games against New Jersey in China in October 2010. The Chinese edition of Inside NBA has a circulation of 600,000. Over 1,000 people lined up for the grand opening of the NBA shop in Beijing. On playground courts you are much more likely to see players wearing jerseys of American players and NBA teams than Chinese teams or even Chinese players in the NBA. 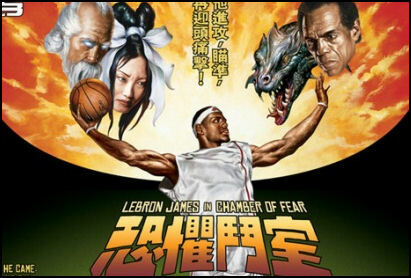 Many Chinese NBA fans keep up with NBA basketball via television and the Internet. Many were turned on top the sport by CD-ROMS and DVDs given as promotions that showed NBA highlights and flashy dunk and spinning moves that caught the imagination of young players. Michael Jordan is still a household name in China. In one popularity poll he ranked higher than Mao. Many Chinese will tell you that his team, the Chicago "Red Oxen," is their favorite NBA team. Allen Iverson is also very popular. There is a Nike-sponsored LeBron James Museum in Shanghai. The top-selling NBA jerseys in China in 2007-2008 were: 1) Kobe Bryant, Los Angeles Lakers; 2) Kevin Gannett, Boston Celtics; 3) Tracy McGrady, Houston Rockets; 4) Paul Pierce, Boston Celtics; 5) Allen Iverson, Denver Nuggets; 6) Gilbert Arenas, Washington Wizards; 7) LeBron James, Cleveland Cavaliers; 8) Dwayne Wade, Miami Heat; 9) Dwight Howard, Orlando Magic; 10) Yao Ming, Houston Rockets. Many thought that Yao Ming only managed 10th because most fans had purchased his jersey some time ago. One of the most popular NBA players and biggest pitchman in China is Damon Jones, a journeyman guard with Cleveland Cavaliers who has played for more than a dozen teams and has a career average in the NBA of 6.8 points. He has a two-year endorsement deal with the Chinese sporting good company Li Ning in which he is paid an annual salary of between $200,000 and $300,000, plus bonuses. Jones was chosen by Li Ning because he was considerably more affordable that big name NBA stars; he has a winning smile and lot a charisma; and he plays on the same team as LeBron James, whose games are widely shown on Chinese television. Negotiations on his contract were tough. There were disputes on almost every point. In the end he was able to get first class air tickets on all his flights between the United States and China. Li Ning scored a major coup when Jones made a last second shot that won a play-off series for the Cavaliers. The shot, made wearing Li Ning shoes, was shown over and over on Chinese television. Sidney Moncreif, a Five-time NBA All-Star and assistant coach with the Golden State Warriors, came to China in January 2009 to serve as a consultant for the Beijing Ducks. In 2010 there was some talk that 35-year-old Allen Iverson might play in China after no NBA team expressed interest in him. In January 2008, ESPN, a division of Walt Disney, and Hong Kong mogul Li Ka-shing paid $253 million for a joint 11 percent stake in NBA China. Other major inventors in NBA China include China Merchant Bank. Marketing partners for the NBA in China include Coca-Cola, DHL, Gatorade, McDonald’s, Lenova, Haier, and Tsingtao. A Chinese investment group, including the Chinese businessman Jian Hua Huang, signed a deal with the Cleveland Cavaliers to obtain a 15 percent stake in the basketball team. Ex-Washington Wizards forward James Singleton and Quincy Douby, formerly of the Sacramento Kings, have helped propel the Xinjiang Flying Tigers, to the top of the Chinese league. Former NBA All-Star Steve Francis played with the Beijing Ducks. At one point there were reports he had left the team while teams said the reports were untrue. Three members of the NBA team the Denver Nuggets signed contracts to play in China in the 2011-2012 season. Kenyon martin plays with the Xinjiang Flying Tigers. Wilson Chandler plays with the Zhejiang Guansha. NBA owners locked out players before the season began in a labor dispute. The CBA said it would accept free agent NBA players (but not players under contract) as long as they promised to play the entire season. "China is a positive place, what can I say," told the Washington Post Marbury, who during his time with the Knicks, from 2004 to 2009, became so unpopular that the New York Daily News called him "the most reviled athlete in New York." The Chinese, unlike Americans - and particularly New Yorkers - "don't fill their souls with negativity," said the 34-year-old point guard, who is known here in China as Ma-bu-li. Marbury won't comment on how much he earns with the Foshan Dragon Lions, saying only that "it's not $20 million." But his NBA-honed talents, which far outshine those of his Chinese teammates, could bring a hefty payoff from a line of sneakers he's hoping will take off in China. He also rejoices at no longer being hounded by media reports of wayward off-court antics, such as an alleged fight on a team plane with his former NBA coach. "I don't care about his reputation in the U.S. I only care about his performance on the basketball court," said Lin Weichen, a basketball student at an all-sports high school in Foshan. "For us, it is a rare and precious experience to watch an NBA player play basketball." Foshan is a sprawling industrial city north of Hong Kong. Most of the time the Dragons lose. But that doesn;t seem to bother fans that "We all love Ma-bu-li. He plays great, and he looks so cool," gushed Yuan Tianqiao, a 15-year-old fan who with some friends waited excitedly outside a makeshift locker room in the hope of getting an up-close glimpse of the heavily tattooed former NBA All-Star from Brooklyn. Marbury's time in China hasn't been entirely trouble-free. When he arrived last year, he played for a team in a grimy coal-mining center in the north of the country. But a partnership he initially described as "nothing but love" soured badly after a few months. He left the team late last year and moved to Foshan. The CBA offers little of the glitz or glamour of the NBA. Marbury - the only player selected for All-Star teams in both the United States and China - carries his own bags and no longer rides to the airport in a limousine. He lives in a hotel suite paid for by the Dragon Lions and eats mostly through room service. The team also provides a Chinese-language teacher. On trips out of town, "I fly economy with the team," he said. "Everyone flies private in the NBA." Nonetheless, Marbury thinks his own future and that of his sport lie here in China. "There is dark in everything. Nothing is all light," he said. But China's size and growth show "they are doing something right, and it ain't the dark side," he said. "This is by far the future. There are strength in numbers." He's hoping these numbers will translate into big business for a line of budget sneakers and casual clothing he launched back in the United States under the brand name "Starbury." The goods were originally sold in an exclusive deal with Steve & Barry's, but the retail chain filed for bankruptcy in 2008. Marbury said he's now in talks with venture capital investors to relaunch his brand in China. "I'm here to play basketball, and I'm here to build my brand," he said. Not only has he become the most talked about former NBA player in the Chinese Basketball Association (CBA), but he is regularly on national TV, has over 163,000 followers on his Twitter-like microblog and pens a column in the China Daily newspaper. After three years in the CBA, Marbury is not quite an overnight sensation, but since joining the Ducks this season he's brought instant success, helping them to their best start yet and raising hopes of their first ever title. And the sudden rise in fortunes is well-timed for Marbury, whose brand of low-cost "Starbury" basketball shoes are expected to hit Chinese stores in time for Christmas. "He may be the best player in the league the way he is playing... if he keeps this up, (Beijing) is going to have an incredible season," said Bob Donewald, coach of both the Xinjiang Tigers and China's national team. "Steph has brought a lot of confidence, he has brought determination and he has got them playing really good right now. It is his leadership as much as anything else," the former NBA assistant coach said. In his third CBA season and with his third team, Marbury signed with Beijing, bringing his game to a major Chinese city that also serves as a base to market his footwear. After Beijing's 99-97 nail-biting win over Xinjiang on Friday, the former New York Knick downplayed his role and deferred to his team-mates. "Our defence is the key to our success, our defence has been really good. Not only have we been playing hard defence, but our defence has been translating into getting a lot of easy baskets," Marbury told AFP. "For the most part I continue to do the little things, rebound the ball, try to get deflections, steals, try to get guys open shots, doing things to win the game." During a multi-million dollar NBA career, marred by public spats with coaches and team-mates, Marbury was often seen as a selfish "shoot first, pass second" point guard who paid too much attention to his personal statistics. But here in Beijing, he has introduced his "love is love" strategy of sharing the basketball and building up the confidence of his sharp-shooting team-mates and making them better. Four Ducks players average more than 10 points a game, including former Atlanta Hawks centre Randolph Morris, who averages 22 points and 10 rebounds a match, while two others average nearly nine points. "We are supposed to share the ball, pass the ball to the open guy. Everyone knows their roles on the team," Marbury said. "Everybody on the team can pretty much shoot the ball. I was kind of shocked at first, but after the first week of practice, I realised that the guys can shoot the ball extremely well." With his Chinese name "Mabuli" tatooed across his forearm, Marbury has done everything he can to acclimatise to China, including eating the food and speaking the language, but winning is what endears him to his team-mates. "Da Ma (big Marbury) initiates our entire offence, he also gets each of us motivated. After all these games, everyone can see how well he distributes the ball," said veteran small forward Chen Lei. "He gives every player on the team more opportunities, he gets us the ball in the right place at the right time, making it very comfortable to shoot." Since joining the league during the 2009-2010 season, Marbury has long said he hopes to bring his Starbury shoes, which retail for as little as US$15 in America, to China's estimated 300 million basketball fans. But Marbury's commercial endeavours are not a distraction to the team, said Beijing coach Min Lulei, who had nothing but praise for his star player. "I am very fortunate to have a player like this, he is very professional, there has been no distractions," Min told AFP. "It is simple. If he doesn't put the game out on the court and win, then there will be no business development, if he plays well on the court, then his business is going to be good." The release of the Australian, who played last season for the Portland Trail Blazers, comes after Xinjiang fired head coach Bob Donewald and allowed former Denver Nuggets forward Martin to leave. Mills has not played for over a week because of a hamstring injury and had asked the team to allow him to sit out another two weeks to fully heal, the Basketball Pioneers newspaper said. The club refused the request. Mills is expected to anchor Australia's national team at the London Olympics. During his 12 games with Xinjiang, the guard averaged 26.5 points a game. Martin reportedly bought out his $3 million record CBA contract days after the sacking of Donewald. According to the Basketball Pioneers, neither Mills nor Martin were allowed to sign with any other pro team until after the CBA season ends in March because of contractual stipulations. "It is deeply disappointing to see a company build a business off my Chinese name without my permission, use the number 23 and even attempt to use the names of my children," the China Daily quoted Jordan, as saying in a statement. "This complaint is not about money. It's about principle and protecting my name," he added. A Qiaodan Sports spokesman said he had not received details of the case from the company's legal department, and thus could not comment on it.